Activated Alumina has the advantages of large surface area, many mciro-pores, well disperser, so it has a high affinity for water/impurity and actived catalyst. 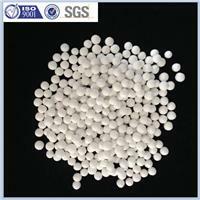 According to the applications of balls, there are 3 types of Activated Alumina Sorbent, Activated Alumina Desiccant and Activated Alumina Catalyst carrier. Meantime interior composition of the crystal phase was divided into mode Y and X-P. The activated balls are widely utilized in the drying agent of multiform gas and liquid, also function is used as sorbent, desiccant, catalyst support in reactors for petrochemical industry, chemical industry, fertilizer industry and so on. KA405: is for dehydrating and drying in air seperation etc.